For you particularly daring boys out there who my be considering asking that cute, adorable priest out for coffee or drinks or a movie - some tips just for you. 1. Avoid detailed and ongoing references only to Jesus, God, the Holy Spirit, your current view on church issues, which liturgy you prefer, or other theological and/or spiritual talking points. Really. We don't want to spend the evening doing what we do every day and twice on Sundays. Assume we watch current television shows (no 7th Heaven conversations, please, but we all love The Vicar of Dibley), listen to music other than hymnody, and enjoy the parts of sporting events that occur after the moment of silence/prayer. 3. Don't talk about the Bible to impress us. We probably know more about Holy Scripture than you, anyway. Refer to tip #1 for further explanation. I once had a date who said to me, "The two parts of the Bible, the King James Version and the New Testament, make for interesting reading." Yeah. I know. And if you don't know what's wrong with what he said, don't date clergy. 4. This should go without saying, but the following topics are no-no's for first dates with priests or anyone, for that matter: how you feel about your ex-wife; your teenage daughter's criminal misconduct; engaging conversations with your therapist; personal fantasies that may be illegal in parts of the South; and any story that includes the phrase, "Hey, y'all, watch this!" We are women. We expect to be treated like women, not a free psychologist. And no one wants to date Woody Allen. 5. "So what's it like being a girl priest?" is not an original question. 6. Don't ask us out for a late Saturday night date. Unlike the rest of the known world, we work on Sundays. Oh, and don't ask us out because YOU are interested in being a priest. Dating a priest and being a priest are not the same thing. 7. Yes, girl priests are girls, first. Yes, we like to kiss and canoodle, too. No, this isn't something you should ask on an early date, but I'll tell you so you can know. 8. If you ask a priest out for lunch and/or dinner, we don't all pray before a meal. Some do. Others don't. You'll just have to figure this one out, awkward as it may be. 9. Just because you aren't Christian or Episcopalian doesn't mean you can't ask a girl priest out. We Episcopalians recognize that God is bigger than anyone can imagine. And love has it's reason of which reason knows nothing, so ask her out. 10. And if you ask a girl priest out in the South, she expects you to a) hold the door open for her; b) pay for the meal; and c) compliment her on her clothing, smile, football affiliation, or sense of humor. Some things are holy mysteries. Just accept them and move on. If she wears a collar on the first date...she probably has no idea it's a date, or is sending you clear messages that this *isn't* a date. At one point in my long life I worked as a full time, professional Religious Education Coordinator. This was during my sojourn across the Tibur. (now back) While there I discovered that working with celibate men was not helping my social life one bit! So, confessing to NO ONE, I tried a famous dating service. I should have been warned by the strange expression on the woman's face as she took info on my work for the registration process, but I still hadn't learned that working for a church puts one in a "other" category. So a man called and we arranged to meet in a Friendly's Restaurant. He turned out to be a skinny and short Italian man who explained that he, too, liked music. In fact he earned a living playing the piano in a well-known night club. (notorious night club is more accurate) "So" he said, "What do you do for a living?" So I told him.....The look of horror on his face was impossible to describe! He threw his hands up in the air, thus spilling his coffee and he shouted "Jesus H Christ, they sent me a God-dam Nun!" then he said: "Goddamit, Miss, I gotta go, excuse me" and he dashed out of the place, leaving me to pay the bill. I am falling out of my chair here! Great story. I am a late-40s, divorced (ex 'changed his mind') female priest with two teenage sons. Dating is not easy... I've been trying the online dating thing, and as soon as the words "clergy" or "priest" pass my lips, the glazed look comes on, and I never hear another word. But about wearing the collar... I recently attended a fundraising gala for a non-profit with which my parish is closely associated. Because I was attending in official capacity, I was wearing my collar, and - no - clerical collar and 'gala' do not go well together (need to add to my wardrobe). Well, as it turns out, at the table I was sitting with the parishioners who invited me was a single gentleman - also divorced & father of teenagers, but not a member of our parish. He met me as a priest - and still asked me out for coffee. Thinks are continuing swimmingly! Well, I realized when I entered seminary at the age of 43, after being divorced for three years, that I'd better be prepared to remain single because no one would want to date a priest. After 25 years of ordained ministry I have found that to be absolutely true. So ladies, don't get your hopes up! Given that it was written in 2009, would you say anything has changed since then? Hope that guys aren't scared off by your collar. You sound like a great person to be around. 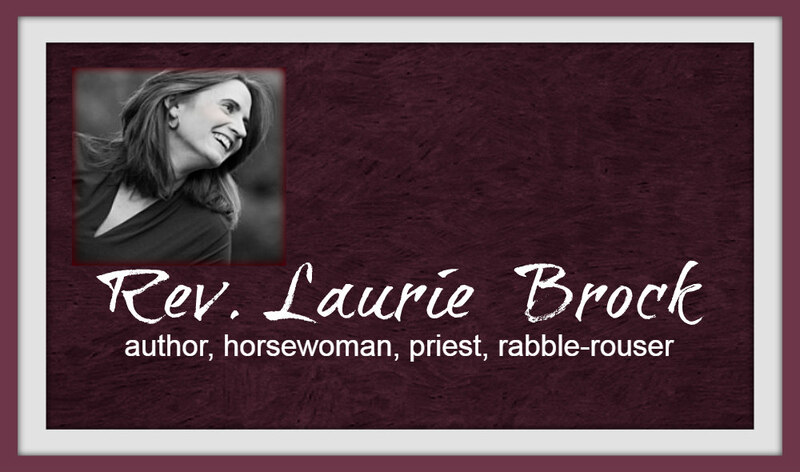 Laurie - this column worked! Even though it was written in 2009! Yes, I read it when I realized that I couldn't take my eyes of this very cute Assistant Curate, and that I would always switch lines so that I could receive communion from her (mainly to stare into her eyes). So I googled "How to Date a Priest", and your blog came up. I must have read it 10 times before I got up the nerve to ask her out for a drink (thanks for point 7,btw). That was almost 4 years ago, and now we are close to celebrating our 2nd wedding anniversary. I thought of your column when I saw that you are blogging on Lent Madness, and I realized that I had never said thanks! So thanks! Wow! Well, glad to hear this! Happy anniversary! My googling of how St Michael the Archangel fits into The Episcopal outlook led me this very funny blog. Pithy, witty... your parishioners must love you. Thanks for a good laugh. Now back to figuring out who St Michael really is.